Neglected tropical diseases (NTDs) are distinguished from the three most prominent infectious diseases of global health concern (AIDS, TB, and malaria), but the aggregate morbidity and mortality associated with NTDs are estimated to be equal to the suffering caused by malaria. Most NTDs are caused by parasitic infections, but included among the NTDs are diseases caused by infection with Dengue virus and other arboviruses (including Zika virus), and by some definitions of NTDs, diseases resulting from infection by viral hemorrhagic fever-causing viruses (including Ebola virus). The etiological agents of NTDs constitute a large number of diverse biological taxa, and almost every poverty-afflicted person living in the tropics suffers from an infection from at least one NTD. Even in a country as wealthy as America, there are an estimated 12 million people infected with NTDs, with an estimated 110,000 to 200,000 new infections per year of Dengue virus alone. In America the risk for NTD infections has a well-defined ethno-geography, afflicting predominantly minority populations, with geographic concentrations in urban enclaves primarily in the Northeast; in rural poor and Native American tribal communities; and in the Southeast and southern border regions of the United States. America’s public health agencies would be better able to prevent the spread of infectious diseases through the development of improved pathogen detection diagnostics and pathogen transmission diagnostics. A detection diagnostic only attempts to answer the question “Is pathogen x present?”, whereas a transmission diagnostic such as pathogen genome nucleic acid sequence data yields extremely useful additional information. This information can not only help to cluster infected individuals (be they patients or animal vectors) and help retrace and predict the timeline and geography of transmission (and thereby help to identify exposed individuals for follow-up monitoring and testing with a typically more affordable detection diagnostic); nucleic acid sequence data also yields insight into transmission payloads (e.g., alleles selected for vaccine or drug resistance, or modified virulence). Thus, a low-cost, highly portable, single-molecule nucleic acid sequencing device and appropriate ancillary computational hardware and software to support “point-of-need” analyses of pathogen genome sequence variation would serve as an ideal foundation for a pathogen transmission diagnostic platform. 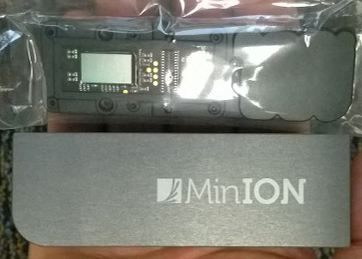 In 2014 Oxford Nanopore Technologies (ONT; https://nanoporetech.com) began a “MinION™ (early) Access Program” or MAP for their iconic nanopore-based nucleic acid sequencing sensor device. The MAP is an ongoing international program whose participants can purchase MinION™ devices, flowcells, and kits for nanopore-sequencing fragment library preparation and license the device’s operating software. The MinION™ is a single-molecule, real-time nucleic acid sequencing sensor device that is about the size of a small harmonica; weighs 87g; and draws only 1W of power from a USB3 port of the ancillary computer (typically a laptop) that runs the device. The low $1,000 cost of the MinION™ and its extreme portability enables its use anywhere in the world, and it has even been used by NASA on the International Space Station. The MinION™ represents an extraordinarily useful and unique foundation for the development of point-of-need pathogen transmission diagnostics for molecular epidemiological surveillance and outbreak response management. I have developed open-source bioinformatic software (Onstream and Metrovar) to facilitate the use of the MinION™ in limited-resource settings for real-time analyses of RNA virus genome sequence variation information, and in collaboration with Drs. 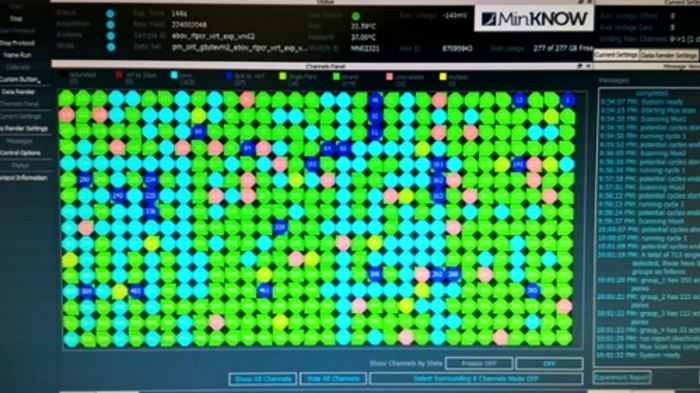 Marilynn Larson and Steve Hinrichs of our department, used this software to help analyze Ebola virus RNA sequence data that Dr. Larson and I generated on MinION™ devices in Dr. Hinrichs’ laboratory.